16 CHAPTER 1. 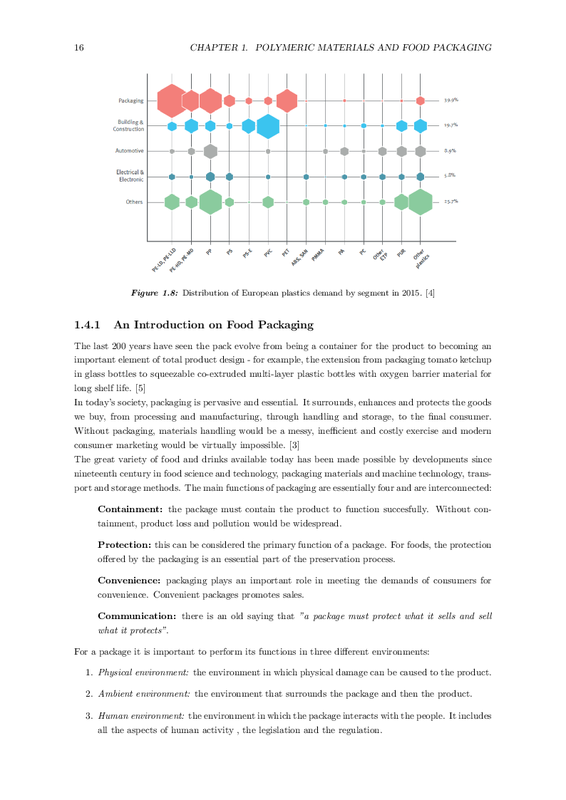 POLYMERIC MATERIALS AND FOOD PACKAGING Figure 1.8: Distribution of European plastics demand by segment in 2015. 1.4.1 An Introduction on Food Packaging The last 200 years have seen the pack evolve from being a container for the product to becoming an important element of total product design - for example, the extension from packaging tomato ketchup in glass bottles to squeezable co-extruded multi-layer plastic bottles with oxygen barrier material for long shelf life. In today’s society, packaging is pervasive and essential. It surrounds, enhances and protects the goods we buy, from processing and manufacturing, through handling and storage, to the  nal consumer. Without packaging, materials handling would be a messy, ine cient and costly exercise and modern consumer marketing would be virtually impossible. The great variety of food and drinks available today has been made possible by developments since nineteenth century in food science and technology, packaging materials and machine technology, trans- port and storage methods. The main functions of packaging are essentially four and are interconnected: Containment: the package must contain the product to function succesfully. Without con- tainment, product loss and pollution would be widespread. Protection: this can be considered the primary function of a package. For foods, the protection o ered by the packaging is an essential part of the preservation process. Convenience: packaging plays an important role in meeting the demands of consumers for convenience. Convenient packages promotes sales. Communication: there is an old saying that "a package must protect what it sells and sell what it protects". For a package it is important to perform its functions in three di erent environments: 1. Physical environment: the environment in which physical damage can be caused to the product. 2. Ambient environment: the environment that surrounds the package and then the product. 3. Human environment: the environment in which the package interacts with the people. It includes all the aspects of human activity , the legislation and the regulation.